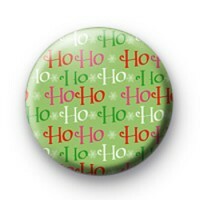 25mm Christmas Ho Ho Ho button badge in green with ho ho ho written in green, red and white festive text. These badges are super festive and very popular at Xmas time. We have a huge range of Christmas badges so be sure to take a look at our category. Ther are really popular during the festive period and ideal stocking fillers.